As someone who is always thinking of ways to develop and schedule content for my site, I must admit that I’ve been sitting on my purchase of Amazing Spider-Man #16 for a couple of months now. It’s not that I wasn’t excited by the fact that my remaining chase to collect every issue of ASM has been reduced from four to three (not counting the annuals. Still not counting them. Sorry). But since I purchased this issue in the midst of my “Top 10 Green Goblin Storyline Countdown,” and I knew I wanted to write some Daredevil content in April to celebrate the character’s 50th anniversary, I thought I’d kill two birds with one stone and unveil my acquisition of the first-ever Spider-Man/Daredevil team-up a few months after the fact. The delays and deliberations of this post actually tie-in pretty neatly to the larger history I’ve had with this issue. As you’ll note on my “Remaining Chase” section, the only other ASM issues I’m currently missing are #1, #3 and #6 – all very historic (and expensive) comics that are very hard to come by with my current budget constraints. 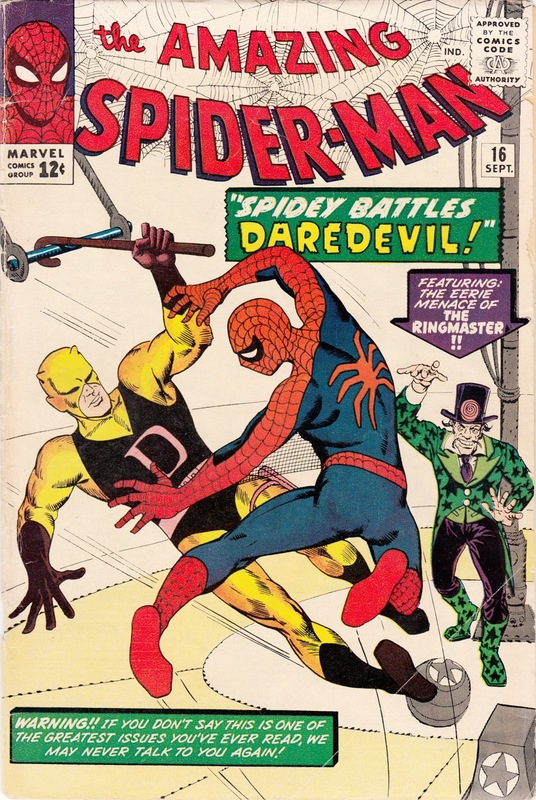 My inability to track down a copy of ASM #16 until now always seemed a bit out of place considering how there is nothing particularly historic or exciting about this comic beyond an early Daredevil appearance (from a storyline perspective, I’d actually say it’s one of the worst Stan Lee/Steve Ditko issues). 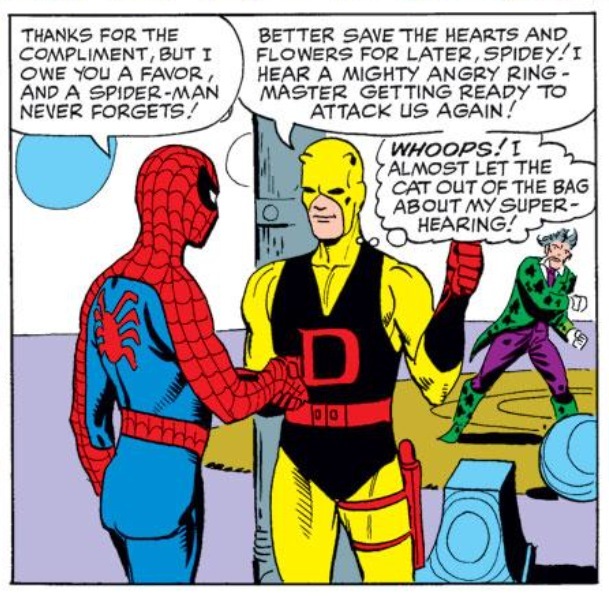 And it’s not even the good Daredevil but the terribly designed yellow-costumed version of the character (how do you introduce a character named “Daredevil” and not dress him in red?). I felt even more shame and embarrassment about not owning ASM #16 during a conversation I had with Marvel’s executive editor and senior vice president of publishing Tom Brevoort at New York Comic Con last October. A friend of mine who used to work for Marvel had passed along my blog’s information to Tom some time ago, so he was familiar with Chasing Amazing and its mission. So as we chatted with each other, he naturally inquired as to where I was with the chase. When I explained the remaining four issues I was missing, a puzzled look came over his face. “Why don’t you own Amazing Spider-Man #16?” he asked. And I didn’t have an answer for him. Things escalated further when I thanked Tom for the meet and greet at NYCC via Twitter and he responded that he was happy to chat and that I really needed to do something about missing ASM #16. Fair point Tom. Fair point. I think if I really examine why ASM #16 never fell into my possession until now, it really all boils down to timing. It’s by no means a cheap comic book to purchase, even in a lower grade, but it’s certainly cheaper than most of the single digit issues and some of the key first appearance comics that came immediately before and after (like ASM #14, #15 and #20). But it just feels like every time I was ready to cross ASM #16 off my buy list, I could never find an affordable copy of the comic in a condition I was willing to accept. And any time I did find a copy of ASM #16 that met all my criteria, I was fresh off a purchase of another comic on my list, making me gun-shy about dropping more money on my collection. Thus, ASM #16 lingered and lingered, destined to remain a part of my long-standing quest until the circumstances were JUST right. A few weeks before I finally bought this copy of the comic, my good friend and Superior Spider-Talk co-host Dan Gvozden texted me that his local comic book shop was selling a copy and for cheap. But the top left hand corner of the front cover had been cut out, which is one of my biggest bugaboos when it comes to my collection. So the comic remained unpurchased. The stars finally started to align a bit at the start of this year when I was honored for my years of service at my 9-to-5 job. I was invited to a special luncheon and received a Visa gift card that I could use anywhere. I dabbled with using this “free” money on a couple of different items to use around the house – maybe some new equipment for my kitchen or my backyard, when I had a “who the hell are you kidding?” moment and went online to one of the Internet comic book shops I like to buy from and searched on ASM #16. They had a copy in VG+ that was ever-so-slightly more expensive than what I wanted to spend, so I made a best offer that I deemed to be fair and reasonable. Within the next 24 hours, I received an e-mail from the retailer telling me that because of the demand for Silver Age Spider-Man comics, they weren’t going to budge from the listed price. I was initially indignant by the response. I wanted to fire back, “well, fine, I’ll just take my business elsewhere.” But there really was no other place to go. This comic has been out of my grasp and mocking me for so long, I broke the first rule of negotiations (which is why this post exists proudly on this web site for the rest of eternity) about not being able to walk away from your final offer. I sheepishly wrote back that I was willing to pay list price, and two days later, I was walking home with a copy of ASM #16. The only thing that kept me from tweeting at Brevoort was the fact that I wanted to sit on this information for a couple of months so I wasn’t headed into April without any interesting content to post on Chasing Amazing. So the monkey that shall be known as Amazing Spider-Man #16 is finally off my back. I now proudly own a copy of the first time Spider-Man has been brainwashed/hypnotized by an adversary, in this case, the absolutely laughable villain known as the Ring Master (who Spidey defeats, simply enough, by closing his eyes). I can now open up my very own copy of this comic and read as Stan beats us all over the head with references to Daredevils very own exciting new title on newsstands now! But most importantly, I can now officially let Brevoort know I own this comic. I’m sure that has been eating away at him since NYCC. And oh yeah, three comics remains before my quest is officially over. If only I could be honored for my years of service with another gift card every month, I might be able to complete this thing before the end of the year! I love old school Daredevil! I do remember this issue as not being one of my favorite but I’m glad you were able to cross it off your list finally! But I do have a question, which I’m sure you’ve answered before. Why no Annuals? I was always such a fan of the Amazing annuals, especially the silver age ones. It’s a silly issue, but it’s Lee/Ditko so like cake, even silly cake is good cake (if you like cake). Ah, annuals… yes, yes… let me summarize… it’s a two-fold situation. One, I despise/resent the fact that of the first 12 annuals or so, half of them are reprints of prior content and since I’m dedicating my money to this very expensive endeavor, I didn’t want to waste my limited resources trying to fill holes on something that was superfluous story-wise. Additionally, from a cataloging standpoint, the Annuals are considered a separate series, just like Spectacular Spider-Man, Web of, Spider-Man 2099, etc. My focus is on ASM #1-700 (and I guess now vol. 3) and once that’s completed, I’m going to focus on acquiring key Spider-Man issues from other series, including those annuals. For the record, I own like 75 percent of the annuals, though I am missing the first three which are must-buys for me at some point, and of course, some of the reprint ones in the middle. Plus, I’m closer to just owning the whole run of ASM without the annuals, which is impressive enough, right? I do like to bring up the annuals as an inside dig to my podcast-mate/buddy Dan who is also working on acquiring the whole run, but counts the annual issues. Makes sense, I never really saw the annuals as being a separate series but I can see how they would be considered as such from a cataloging standpoint, as you explained. And your collection is certainly impressive, in fact I’m quite envious. Amazing Spider-Man holds a special place in my heart as well, and is one of a few important series to me that I have read every issue of, although my collection is unfortunately nowhere near as complete as yours. Maybe one day! Any strategic plans underway to collect the last three issues? Strategies? Well, I have a target price I’m willing to pay for each, so it’s really just a matter of putting aside some money and then constantly stalking certain places until the stars align. Anytime I’ve gone too far off the grid to get something, I always end up slightly unhappy with the end product. Meanwhile, we can all know that I am closer to finishing my quest than Mark because I have all the annuals. Ahem. I love any Daredevil and Spider-Man team up. I am not sure why it is so appealing to me, but DD and Spidey give me a kick. This was a fun article to read. Reminded me of my comic collecting adventures. I am new to collecting comics and to this website. Have you ever written a column with advice on buying comics? Maybe listing the best web sites and/or on-line comic stores? Just curious…I don’t mean to ask you something not in keeping with your site.